Branson, MO (March 23, 2010) Organizers of Branson, Missouri’s highly successful Hand in Hand – Branson Honors Purple Heart Recipients, have scheduled a press conference for 2 pm, April 1, 2010, at the Hamner Barber Theatre, 3090 Shepherd of the Hills Expressway, Branson, MO to outline highlights of the 2nd Annual Purple Heart Recipient gathering. On April 22-24, 2010, Purple Heart Recipients from across the nation will come to Branson, the city widely recognized as America’s favorite destination for Veterans. The Opening Ceremony will feature experts from the National Military Order of the Purple Heart speaking about Veteran’s benefits. There will be a panel discussion, a question and answer segment, and an opportunity for those seeking some ‘one-on-one’ time for more personal, in-depth questions. This special event is open to all veterans and their spouses, not just combat wounded. In 2009, some of the Purple Heart Recipients participated in a drawing to win an opportunity to spend the morning alone with a professional fisherman on one of the area’s pristine lakes. The fishing pros graciously provided the boats, tackle, fuel, time and bait for the unique experience. This event, back by overwhelmingly popular demand, has been moved to a new location, the State Park Marina in Branson, in order to accommodate more fishermen and more boats in 2010. The State of Missouri waived the license fees for the Purple Heart Recipients citing the “emotional healing” that comes from fishing and being on Missouri’s waters. ‘Words cannot express the healing that took place at the event in 2009.’ one of the attendees said, “I have never been treated like this in my life. Never has anyone honored me the way Branson has these past two days.” Hearing those simple, heartfelt sentiments, Larry Milton, owner of Branson.com and a Marine, decided to give something back to the veteran community. And in presenting Hand in Hand – Branson Honors Purple Heart Recipients, the healing process has begun. Visit www.Branson.com, the official website for EVERYTHING that’s happening in Branson, Missouri! The Branson Tri-Lakes Kiwanis Club will host its annual Easter pancake breakfast on Saturday, April 3rd from 7:30 to 10:00 am. 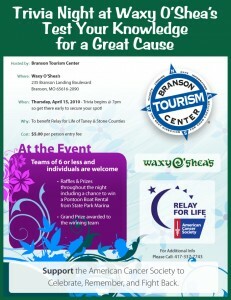 The breakfast will be held at Applebee’s at 1836 W. Hwy 76 in Branson. All children 4 and younger eat for free, and adult tickets are only $5. Everyone should come hungry, because the pancakes are all you can eat! All proceeds from the breakfast will benefit the Pregnancy Life Line as part of the Kiwanis Club’s efforts to assist young children. Walk-in guests are welcome, or tickets are available from any Kiwanian. Call 417-335-9231 for tickets and more details. The Easter Bunny will be on hand to visit with the children and pictures by Swift Shots are available for only $5. Kiwanis is a global organization of volunteers dedicated to changing the world one child and one community at a time. Keeping with this mission, club members are busy throughout the year carrying out much-needed service projects here in the Tri-Lakes area. The pancake breakfast, benefitting the Pregnancy Life Line, directly supports the children and families of our community. Previous breakfasts generated nearly $2,000 for charitable contributions. Thanks to the generous support of Applebee’s, Bob Evans and Golden Corral, who are donating the supplies for the pancake breakfast, the Branson Tri-Lakes Kiwanis Club is helping to bring some Easter fun to our community’s kids and their families. The Branson Tri-Lakes Kiwanis Club meets every Tuesday at noon at Mazzio’s Italian Eatery. If you are interested in more information about the Branson Tri-Lakes Kiwanis or if you would like to join the club as it serves the children of the world, visit www.bransonkiwanis.com. Neal McCoy is Coming Back to Branson! Two time entertainer of the year, Neal McCoy is no stranger to the country music industry. His career has landed him 3 Platinum albums, 1 Gold album, and 5 number 1 hit singles including “No Doubt About It”, “The Shake”, and “Wink”. Neal is a true performer, spending 220 dates on the road as well as performing overseas for our military in the past 14 USO Tours. Now in 2010, we are happy to announce that Neal will be spending some time in Branson, Missouri at the Clay Cooper Theatre! Oh, and don’t forget your group can have a mouth-watering lunch or dinner with us and you never know, Neal himself may just join you! Neal’s first show at the new Clay Cooper Theatre will be Tuesday, March 30th @ 8:00pm! The Baldknobbers began the family entertainment phenomenon in 1959, when the four Mabe brothers began entertaining fisherman on the downtown Branson lakefront. Today, over fifty years later, the second and third generations of the Mabe family continue that family tradition of combining your favorite country classics, with hot-new country hits and hilarious country comedy into a fast paced show. It’s the songs you know and comedy that makes everyone (even the kids) laugh out loud. The Mabe brothers adopted the name of an old Ozarks vigilante group that held their meetings on a treeless hilltop or “bald knob”. So when the Mabe brothers started Branson’s first show, it was just natural to take a regional name. “The Baldknobbers show is entirely a group effort. Every cast member gets to put their stamp on our new show each year. The Baldknobbers don’t have a star, the show is our star,” Tim said. Longtime Baldknobbers’ fans and new fans alike appreciate the Baldknobbers’ family traditions. It’s the great music and side-splitting comedy that have made this show popular from generation to generation. Come celebrate over 50 years of family fun with The Baldknobbers Jamboree! The Baldknobbers Jamboree Show-“The Show That Started It All”-is located on the famed 76 Country Music Boulevard in Branson, Missouri, with performances Monday through Saturday at 8 PM beginning in March and running through mid-December. For tickets and to confirm show times and dates go to www.Baldknobbers.com or call toll free 800-998-8908. On March 26th, 2010 at 7 p.m. at the Lodge of the Ozarks in Branson, MO a decorated Iraq War veteran Jerrod Fields, who lost his leg in a heroic battle and became a champion athlete training for 2010 Paralympic Games will share his remarkable story. Fields, 27, grew up in a Chicago neighborhood “flooded with gangs and drugs”. His mother died of lung cancer when he was 5. His father was shot and killed when he was 11. Jerrod joined the Gansta Disciples but dreamed of education and sports and attended Tennessee State University for two years. He then enlisted in the Army and was deployed to Iraq in January 2005. A month later on reconnaissance mission in Baghdad, his ankle and foot were mutilated by a roadside bomb. After managing to drive his four fellow soldiers back to base (this act of valor earned him a Bronze Star and a Purple Heart), Fields faced a life-changing choice in a hospital in Germany; have surgery and be discharged, or amputate and stay a soldier. He chose amputation, and after receiving a C-shaped prosthesis, worked himself quickly into combat shape and prepared for redeployment into Iraq in 2007. Two days before redeployment Jerrod found out he was accepted into World Class Athlete Program. Having never run track before, Jerrod started training for Paralympics and with a year, was running 100 meters in 12 seconds flat. “We don’t know what’s in us until we get the opportunity that pulls it out of us,” says Jerrod Fields. He credits his unwavering faith in God for pulling him through and making him victorious over challenges. His appearance in Branson is sponsored by World Missions Alliance of Branson West, MO and is part of an inspirational event VICTORIOUS: WMA Conference taking place March 24th – 27th, 2010 at the Lodge of the Ozarks in Branson, MO. Other speakers include bestselling auther Mark Batterson, former Prime Minister of Ethiopia, Tamrat Layne and American Idol 2010 contestant Dave Pittman from Mountain Home, AR. The BHS jazz students competed in the MSU Festival last weekend. The 2 o’clock Big Band earned first place in the 5A division. Third place was awarded to the 2 o’clock Combo. The Coffee House Jazz Band was awarded second place in the competition. The students will travel to the Greater St. Louis Jazz Festival to be held April 17 on the campus of the University of Missouri-St. Louis. The Big Band and the Coffee House Band will be recorded and participate in a clinic led by a professional jazz musician. The students are under the direction of John Kerley. Evelyn Fullerton and family will present a musical program about her father, Earl “Chick” Allen, a pioneer of Branson’s entertainment and tourism industry, March 14 at the White River Valley Historical Society’s quarterly meeting. The meeting will begin at 1:30 p.m. at the Historical Society Museum, 297 Main Street, Forsyth. Chick Allen was an original member of the Baldknobbers Jamboree, one of the first public relations representatives for Silver Dollar City, and owner of his own attraction, the former Wash Gibbs Museum, on Hwy. 76 at the Taney-Stone County line. Allen played the jawbone of a mule among other instruments. He was also an expert on home remedies and lectured on Ozark medicinal roots and herbs at Washington University in St. Louis and William Jewel College near Kansas City. Evelyn Fullerton, Allen’s eldest daughter, will lead a group of family members and guests in a musical tribute. Family members include granddaughters Judy Fullerton Rice and Jewelene Mabe, grandsons Jim Fullerton and Barry Mabe, and great grandson John Fullerton. Guest musicians are Jim Glaspy, Katey Glaspy and Louis Darby. Jig dancing is also part of the tribute. Additional information about the White River Valley Historical Society is available by contacting the Museum at 417-546-2210 or emailing to wrvhs@hotmail.com. The Museum’s regular hours are 10 a.m. to 4 p.m. Monday through Friday and noon to 4 p.m. on Saturday. After many years of planning, research and development, The Vacation Channel is now broadcasting in high-definition. Your favorite programming from “Branson’s Televised Tour Guide for over 20 years,” The Vacation Channel, can now be received over the air with this high-definition upgrade on digital channel 36-1. The Vacation Channel will also continue to broadcast our analog channel 38 for a time, to allow our viewers to make the transition smoothly. That analog signal on channel 38 will be going away soon, so to continue receiving The Vacation Channel, you will need to retune your digital television or digital converter box, to our new digital channel 36-1. If you have questions about picking up either of our broadcast signals during our upgrade, please don’t’ hesitate to contact us at The Vacation Channel and be sure to log on to our website, www.viewbranson.com for more exciting news and updates along the way. The Vacation Channel, Inc. is Branson’s television station. Locally owned and operated, The Vacation Channel has provided quality vacation and weather information along with award-winning locally produced programs since 1989. Broadcast over the air on analog channel 38 and now digital channel 36-1, and carried on many area cable systems, the television station serves Taney and Stone counties in the tri-lakes region, as well as our recent expansion into the communities of Nixa, Ozark, and Highlandville on the SuddenLink cable system in Christian County. Beginning Saturday, the Presley family will be seen weekly in more than 40 million homes. Their half-hour music and variety series premiers at 6:30 p.m. “Presleys Country Jubilee” stars three generations of the family, and the producers have added guest appearances by other Branson performers. The show airs during the six-hour Saturday night schedule of continuous music and entertainment that earns high Nielsen ratings. It follows “Reno’s Old Time Music Festival” and precedes “The Marty Stuart Show.” The channel is carried by systems including DISH Network, DIRECTV, Comcast, Mediacom, Time Warner and more than 600 rural cable systems.